Simulink® Check™ provides industry-recognized checks and metrics that identify standard and guideline violations during development. Supported high-integrity software development standards include DO-178, ISO 26262, IEC 61508, IEC 62304, and MathWorks Automotive Advisory Board (MAAB) Style Guidelines. Edit-time checks identify compliance issues as you edit. You can create custom checks to comply with your own standards or guidelines. 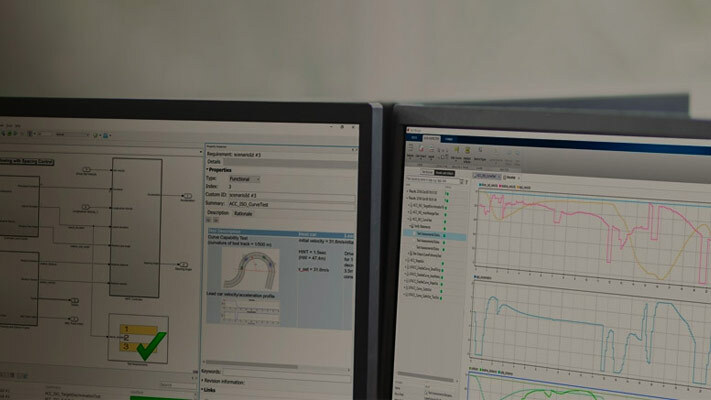 Simulink Check provides metrics such as size and complexity that you can use to evaluate your model’s architecture and compliance to standards. A consolidated metrics dashboard lets you assess design status and quality. Automatic model refactoring lets you replace duplicate design elements, reduce design complexity, and identify reusable content. The Model Slicer tool isolates problematic behavior in a model and generates a simplified model for debugging. Support for industry standards is available through IEC Certification Kit (for ISO 26262 and IEC 61508) and DO Qualification Kit (for DO-178).